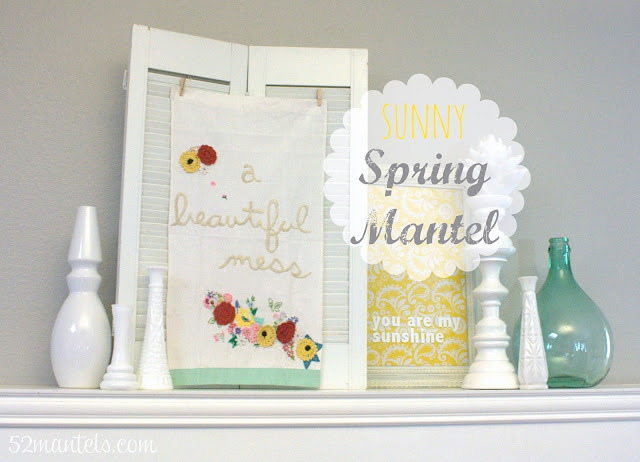 52 Mantels: Sunny Spring Mantel! Happy Monday, friends! How about a little Mantel Monday today, for old times' sake?? I've got my Spring mantel up (buh-bye Easter mantel!) and it's awfully sunny because I'm in a sunny-kinda mood this week. The major inspiration for this mantel came from a pretty Anthropologie tea towel, which was a gift from a sweet friend! Aren't the flowers fun and fresh?! Other deets: the demijohn is the same one I revealed last week (for those who asked last week, a demijohn is used for wine-- I got this one in Italy). 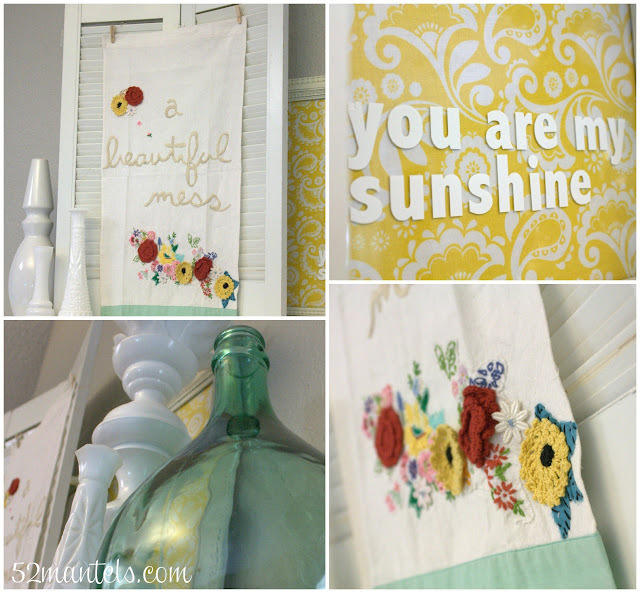 The "you are my sunshine" art is part of series hanging on my wall (the other two frames say "you make me happy" and "when skies are gray", of course). That just about sums things up. Happy Mantel Monday! PS. You may have noticed my absence in the latter part of last week. I was dealing with some yucky health issues and I 1) totally forgot about our weekly link party and so I 2) just gave up on my other blogging plans for the week. Friends, sometimes you just gotta know when to fold 'em. Am I right?! I've been following for a while now. I love your mantles! Such a cool idea to constantly change & brighten a little area. I don't have a mantle but I've been thinking of doing somthing with a built in corner shelf I have. Thank you for all the pretty decorations you share . I have two mantles - so its always a challenge to seasonally decorate both . Thanks, Jaime!! And, I totally agree with you on that! I love Spring and Summer! Lovely, of course, Emily! 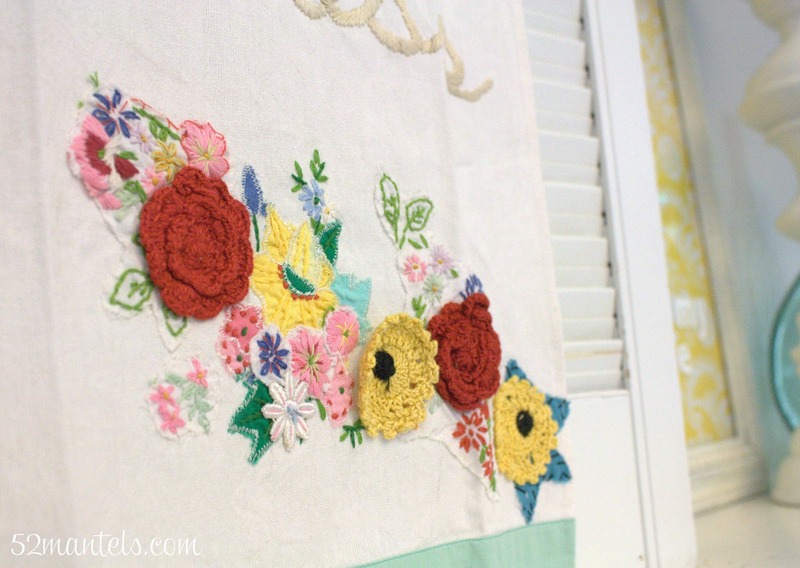 That tea towel is such an inspired jumping off point -- enjoy! Lovely mantel, the yellow paisley adds just the right amount of sunshine! Aw, thanks so much! I love love love yellow! What a fresh and beautiful mantel Emily! Thanks ladies! You're always so sweet! Love the milk glass vases - so vintage! Thanks for the feature Emily! I love all of the ideas you shared and I'm looking forward to coming back this week for your party. My pleasure, Jennifer! Thanks for sharing your creativity with us! LOVE IT! Soooo super duper jealous of that tea towel too... I wanted to buy it recently, but passed. See you soon, friend. HUGS!! See you SO SO soon! Yay! That tea towel is so sweet and perfect! It really pulls together all the other decor elements. 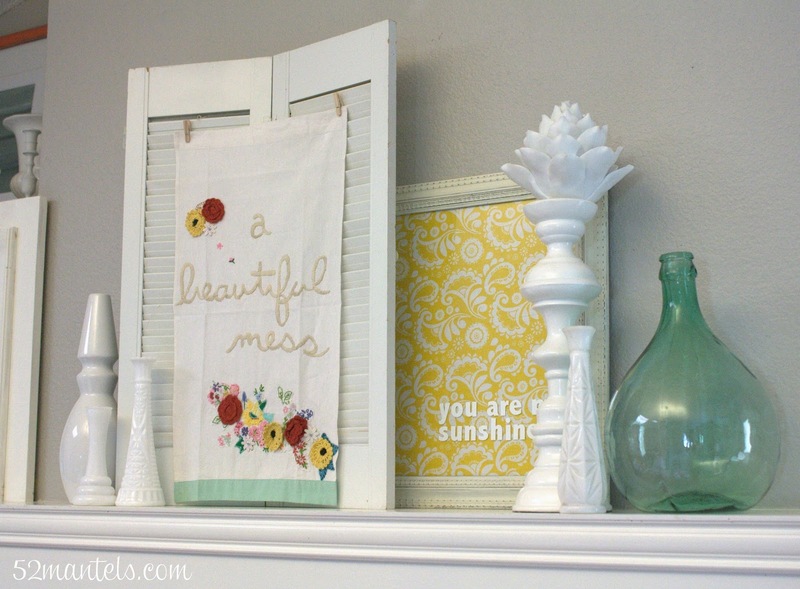 Who would have thought to use a tea towel display in a mantle vignette?!! Thanks so much, Anjana! I love this towel too. Too pretty to hide in a drawer!